In a recent post, I talked about ways to navigate family vacations after a divorce. As a divorced parent, you might face similar challenges during the summer months – especially if both you and your ex work outside the home. It’s good to know you can overcome any challenges with proper communication and an extra dose of organization, ensuring that summer break is a great time to connect with your kids and create lasting memories together. Camp – Camp registration is already in full swing, and most camps fill up quickly. Thankfully, there’s no shortage of fun options to explore, including everything from day camps and overnight camps to themed camps that feature sports, art or science. Keep in mind that you and your ex-spouse will both need to provide emergency contact information, an approved list of individuals who can pick up your child and up-to-date immunization records. Babysitters – A nanny or babysitter is a good option for younger children. Discuss the details with your ex: Will the sitter come to both houses? Where can he or she take your children? How will you both communicate with the sitter? Above all, be sure to devise a plan that’s fair for both parents. For instance, you might decide to send your child to camp for half the day and then divide the remaining time with your ex-spouse. Whatever you choose, try to work with your ex-spouse in a way that is both accommodating and helpful. And remember that your kids should be the primary focus. 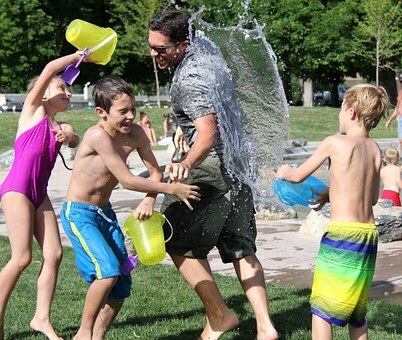 Most parenting plans factor in equal summer vacation time for both parents. Be sure to share any plans with your ex-spouse far in advance, especially if you’ll be traveling. For many families, this can be a great excuse to load up on grandparent time. Your kids will be thrilled, and you’ll save on childcare expenses. Win – win. Your kids have been looking forward to summer all year long. Instead of viewing this time as stressful and exhausting, try to slow down and enjoy it. Remember that you can catch up on work, chores and errands when your children are with your ex, so reserve the time when you’re together for fun activities. While it’s important to maintain at least a basic schedule, try to be flexible as well. After all, some of the best memories are created when you’re spontaneous and relaxed. David Lowenstein, Ph.D. is a psychologist and the clinical director of Lowenstein & Associates, Inc. in Columbus, Ohio. In addition to providing therapeutic services to individuals and families, he offers training and consultation to numerous associations, schools and agencies around the country. Additionally, he is a frequent radio and TV guest and a resource and contributing writer for numerous newspapers and magazines nationwide. Contact Dr. David Lowenstein at 691 South Fifth Street, Columbus, Ohio, 43206, or call 614.443.6155 or 614.444.0432.